I’ve been on a hunt for something to fill the wall space in Taylor’s bedroom at the cabin. It’s a large space, both vertically and horizontally. Taking a water direction for the décor seemed to make sense, for obvious reasons, but most of the nautical themed décor for kids’ rooms (at least this year) seemed to have images of sharks. I have vivid memories from when I was a kid, thinking there were sharks in the lake. I could not understand that although sunnies may nip at your toes in a Minnesota lake, nothing is going to take off a leg. Clearly, I watched Jaws at too young an age. 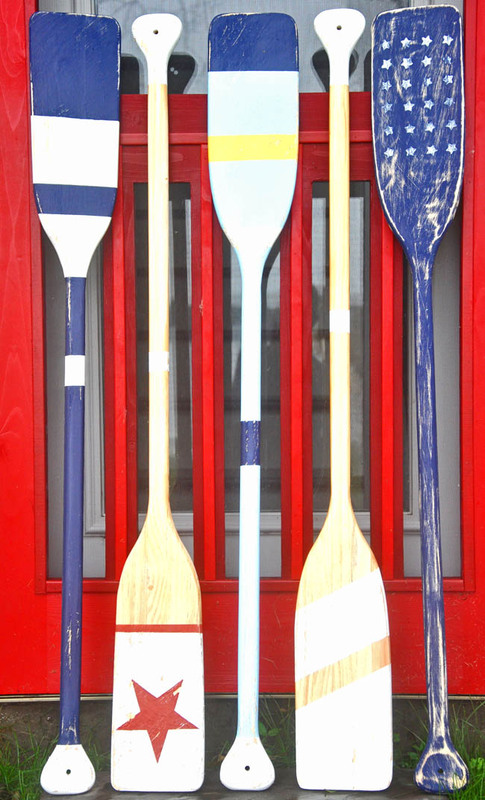 I kept coming back to oars or paddles. There are some super cute ones available this year, but I needed a fair number to cover the space and needed them relatively quickly (design needs to be efficient when dealing with a short Minnesota summer). 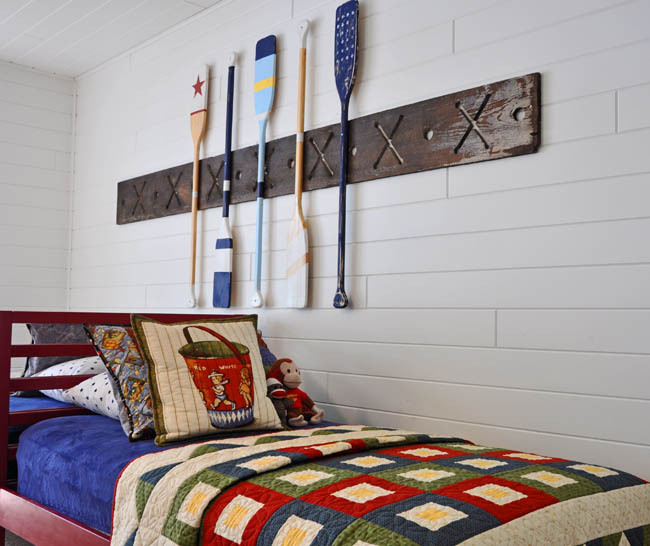 If DIY is not your thing, check out these cute options from Pottery Barn. So, I shifted gears and took a DIY approach. Knowing that I would be sanding off any veneer, painting them and distressing them (to give a vintage feel), I looked for the cheapest wood ones I could find (and source quickly). These oars from Walmart were surprisingly perfect. Step by step shown below. I poked around on Pinterest and online generally to find styles and color combinations I liked. 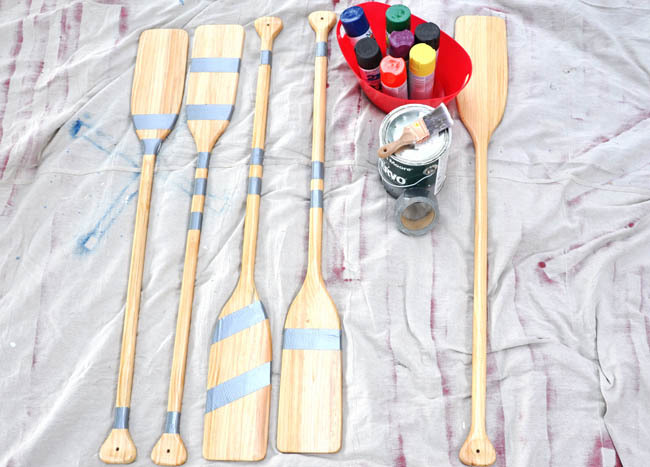 I made a sketch of each oar, so I knew where and how to tape off the lines. Planning ahead, especially when painting them over the course of a few days, was critical. For the stars on the navy oar, I used a small stamp and applied a thin layer of paint on the stamp with a brush (otherwise too much paint would glom on to the rubber of the stamp). Sounds more complicated than it was. 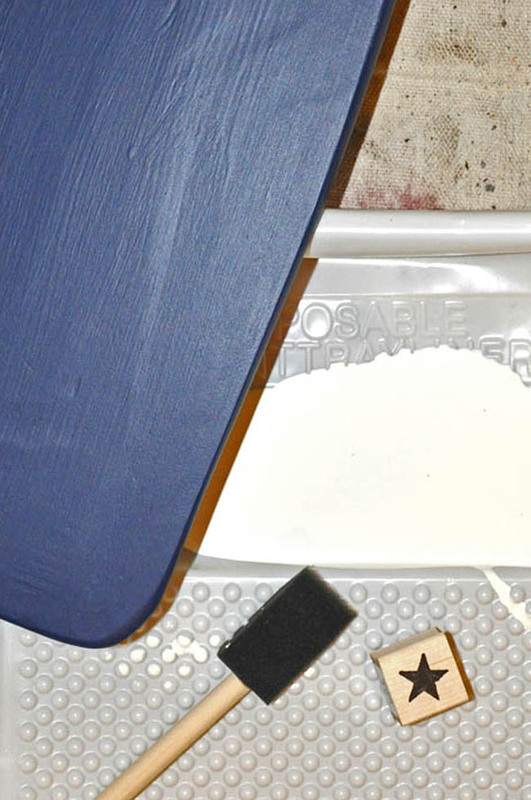 For the distressing – simple sandpaper and the courage to dive in and ding up what I had just worked so diligently to paint. 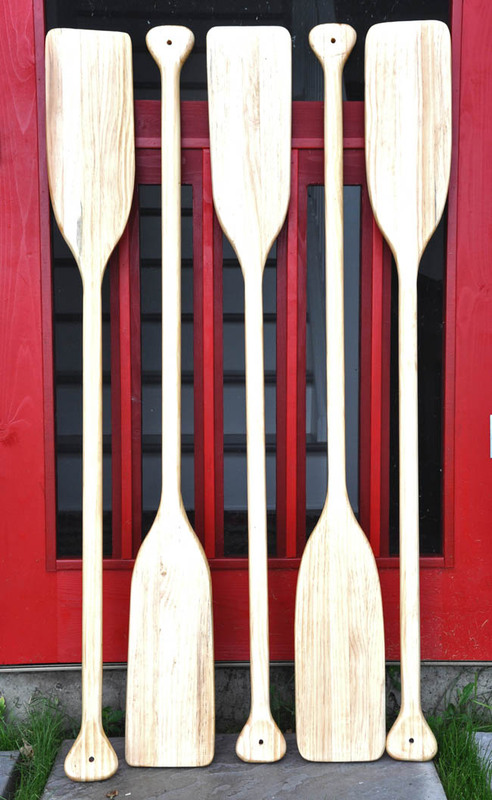 It took me a while to determine how best to hang the oars. I wanted to avoid putting several holes in the wood paneling. The solution came with a large piece of wood from my mom, who had kept this random piece for years, knowing that it would one day find a perfect home. I think it has. 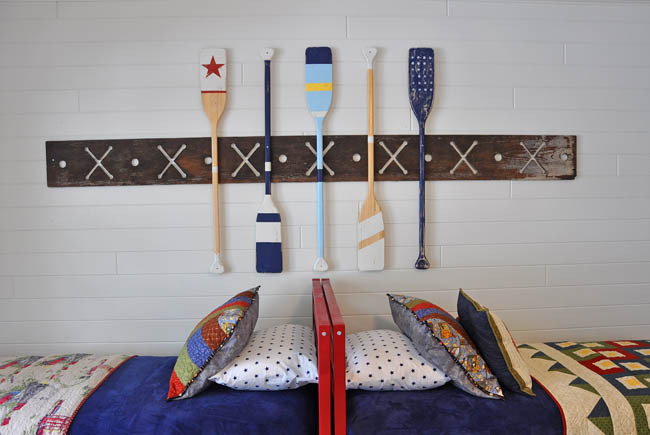 I love how the creamy walls come through the dots and the Xs on the wood, with the colorful oars staged throughout. Reality Check. I used duct tape (which actually was originally dubbed “duck tape” – who knew!) because I didn’t have painters’ tape on hand. Not recommended. It left a bit of a film since the backing melted in the sun, and didn’t leave nice clean lines. My less-than-stellar initial paint job made the decision to distress the finished product pretty easy! These are great Kerry! I love the bold color choices against the white wood! Great job on the oars! Love them!